A dental prophylaxis is a dental procedure that is performed primarily to help reduce the risk of gum and tooth disease. 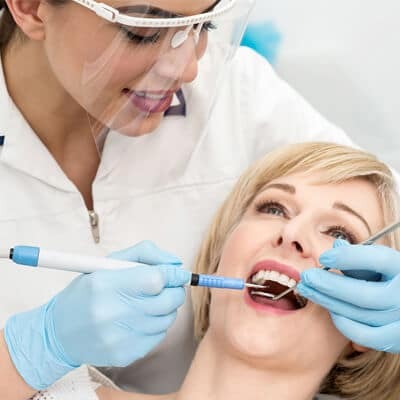 Also known simply as a prophylaxis or prophy, this dental procedure is recommended to be taken every six months or yearly, depending on a patient’s history. It is performed by a dentist or licensed dental hygienist who has received specialized training in dental care. During a dental prophylaxis, your dentist performs both scaling and polishing. During the scaling process, dental tools are used to remove tartar, plaque, and stains from the teeth – including below the gum line. The polishing process smoothens your teeth removing rough spots which might otherwise attract bacteria. Some dentists also offer dental sealant treatments, which are designed to strengthen teeth and further prevent tooth decay. The most important part of a dental prophylaxis involves cleaning below the gumline. If you floss and brush your teeth regularly then you keep your teeth relatively healthy above your gums. However, below the gums it is difficult for a toothbrush to reach and it is here that dental calculus can build up. This exposes you to the risk of gum disease and dental decay. During a dental prophylaxis, your dentist will also inspect your teeth and jaw for any obvious signs of ill health. This inspection may reveal underlying medical issues such as receding gums, erupting wisdom teeth, dental cavities, or even oral cancer – some of which will require immediate treatment. Early identification of dental problems can help you deal with them before they become serious. Your dentist can make recommendations about the frequency of getting prophylaxis appointments on the basis of a patient’s history and overall oral health. Some patients may benefit from more frequent appointments, while others may need a thorough teeth cleaning less frequently. While teeth cleanings are often used by others as an excuse to get patients in for a checkup, patients can book checkups, including dental X-rays, without needing a dental prophylaxis.